Well, what do you know? Getting a fresh start on these Newberry Award winners has been enjoyable. This is one I never would have picked up if not for this goal (#2 on the list). I had never even heard of it until I found it on the list of Newberry winners. It's interesting how some books get a lot of hype, and then there are some that should get a lot more. I do think historical fiction can be a hard sell for kids sometimes, so you may have to talk these up...or casually leave them out on the coffee table for them to discover--whichever works! 5 stars: This was great! Historical fiction with a hint of mystery and a dash of magic. Grisini is a puppet master with a shadowy past, who works his trade on the streets of London, circa 1860. He has two foundlings that work with him and for him: Lizzie Rose, an orphan whose father was an actor; and Parsefall, a boy he "rescued" from the workhouse. The puppets are not the English Punch and Judy shows, but rather marionettes--or fantocinni, as Grisini calls them. Lizzie Rose plays the music and Parsefall has worked up to maneuvering some of the puppets. He also steals for Grisini from those watching the show. When Clara, a girl from a wealthy family, sees the puppet show in the park one day, she is enthralled. She decides this is all she wants for her birthday--though of course it will not be all she gets. After much begging and even some tears, her father relents. Clara's other siblings all died of cholera some years back, and her parents still mourn their loss heavily. To Clara, they have become the Others, and she is sick of visiting the cemetary on every holiday (including her birthday) and constantly being reminded that they are gone while she is not. She is certain her 12th birthday will be the best ever. One other player in this drama becomes increasingly important as time goes on: the old witch Cassandra. She has a fire opal which has given her magical strength over the years and allowed her to control those around her. Now in her old age, however, the opal is consuming her. She had a terrible argument with Grisni years ago concerning the opal. He had mentioned some way to get rid of it, but she had never let him finish before cruelly injuring him. (She thought she had killed him, but then her second sight tells her otherwise.) The unfinished sentence haunts her now. She must summon him to her bedside and learn what she can. When Clara goes missing the night after the birthday party, police think she was kidnapped. They suspect Grisini, but can't find any evidence. Lizzie Rose and Parsefall also suspect Grisini; even more so as they begin to hear rumors and stories of other missing children over the years. They had gotten along quite well with the Clara, in the limited time before the puppet show started, and are determined to help her if they can. Then they make a terrible discovery. This was great! Schlitz evokes the foggy, shadowy underworld of London quite well. I could picture every part of it, from the rope handrail on the stairs at the cheap boardinghouse where Grisini and children lived, to the cold mysterious tower that was Cassandra's home in Strachan Gyll. The point of view switched every so often between characters, which added richness and depth to the story. There was a couple of magical threads that wound their way through the narrative, but magic wasn't necessarily the focus of it. The puppets were what tied everything together. Due to content and length, I would give this to older middle graders/younger teens on up--so probably 12+. I actually think this would be a great one for adult book clubs. There would be some interesting things to discuss. Including this one I've been thinking about since finishing it: who was the real puppet master and who were the puppets? Content: Physical violence--some of it toward children, drinking mentioned many times, pickpocketing, a handful of swear words, intense scenes, deaths of a couple of the main characters. 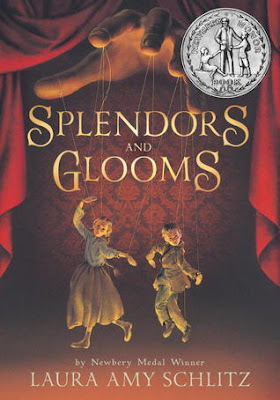 After I finished reading Splendors and Glooms, I realized there was another book with many of the same elements: historical fiction, a puppeteer/apprentice boy, a lonely wealthy girl, and threads of magic. Of course, there are many differences as well. 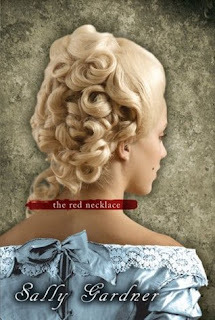 To start with, The Red Necklace is for teens and includes an element of romance between Yann and Sido. Rather than 19th century England, this one is set during the French Revolution. And fair warning--the puppets in this one are called automotons, and they are creepy. So if you or your tween liked Splendors and Glooms, give this one a try! Yann is a magician's apprentice in Paris, along with his protector Tetu (who is a dwarf.) When their act is summoned to perform at the party of a Grand Marquis, they all have uneasy feelings about it, but decide to go anyway. Then magician recognizes Count Kalliovski as on old acquaintance, an evil man who's personal motto is "Have no mercy. Show no mercy" and who has most of the French aristocracy under his blackmailing thumb. When they see the Count at the party, their misgivings turn to a dreadful certainty that things are not going to end well for them. As Yann is figuring out an escape route, he meets the Marquis' daughter, Sido, also summoned to the party by the Count for inexplicable reasons. As they help each other, their paths are intertwined in ways that will come back together again--but this time it will be Yann who must help Sido escape, and it will take every ounce of planning, magic, and luck they can spare. But escaping from the Revolution may be a different matter altogether. Historical fiction with threads of magic, suspense, and romance running through it. Yann and Sido are characters to root for. The villain is sufficiently creepy (I'm still trying not to think about the automotons), and over it all hangs the impending Revolution. Very well done. Have you read either of these? Which did you like better?